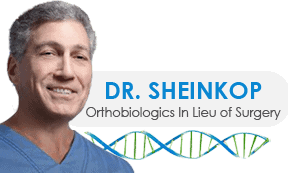 Who with osteoarthritis may benefit from Regenerative Medicine? First of all, let me expand on the concept of Regenerative Medicine at times also understood as Cellular Orthopedics or Stem Cell therapy. Cells with stem cell properties are present in bone marrow, the peripheral circulatory system, adipose tissue, synovial tissue, muscle tissue, and tendon. At this time, the FDA allows point-of-care bone marrow aspirate intervention for arthritis. From a clinical standpoint, the stem cell concentrate of bone marrow aspirate is technique-dependent and I have found it to be an ever increasingly important factor of therapeutic benefit. When it comes to Adipose-Derived Stem cells, use of these products places risk upon the clinician and the patient because they do not meet the criteria of homologous use and are not autologous. Enter the latest interest in amniotic fluid concentrate with all the marketing hype. As of this time, to the best of my knowledge, there is no clinical outcomes science to justify such use. I should know as I am the Principal Investigator in the largest Clinical Trial involving amniotic fluid for arthritis ever undertaken. Next, the reader should understand that Osteoarthritis is graded, not all OA is the same. To qualify for a Regenerative Medicine procedure, the degree of arthritis must not exceed grade three based on Imaging and Physical Examination. The standard grading system is termed the Kellgren-Lawrence Scale in which the X-ray image is scored. The physical examination is also taken into account to confirm that the extent of degenerative deformity has not exceeded inclusion criteria.